We are one of the leading Manufacturer & Exporter of Annatto Color. These are widely acclaimed in the market for their accurate composition, effectiveness, aroma and flavor.Our quality analyst test these products on various parameters so as to ensure their adherence to set industry standards and quality norms. 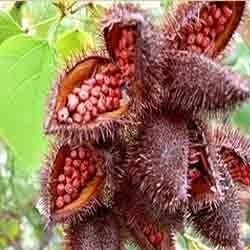 Our prominence in this domain has helped us come up with high grade Annatto color. These are processed under the strict supervision of our chemical experts using premium quality raw material that are procured from some of the most reliable vendors in this industry. Our products are widely acclaimed in the market by our clients for their superior quality, balance composition, effectiveness and no side effects. These are widely used in Butter, milk, margarine, cheese and many other dairy products. Clients can avail these from us as per their requirements. Looking for Annatto Color ?